1. More stores in subways. 2. More kiosks in subways. 3. Cafes/coffee shops in subways. 4. Internet cafes in subways. 5. Advertising on bus platforms. 6. A better marketing program aimed at people who hate traffic. 7. A temporary tax on gasoline prices in Toronto in order to raise extra revenue. A 2 cent increase per litre in gasoline prices would raise enough money expand/improve service and would not harm the economy. As TTC service improves there will be less drivers and more riders and the gas tax program can be phased out. 8. Better washrooms in key stations (adjacent cafes/stores mentioned above). 9. Cleaner washrooms with more regular cleanings. 10. Cellphone access in subway stations and onboard the subway (for safety reasons). 11. Wi-fi internet in subway stations (see internet cafes above). 12. More ATM machines in subway stations and near entrances. 13. Stop short-turning buses. Keep to schedules. 14. A marketing campaign that shows using the TTC is both cool and smart. 15. A TTC Taxi Cab service - Charge the same rates as other Toronto taxi companies (also brings in extra revenue) and expands the TTCs visibility and viability. The purpose of the TTC is to provide transit within Toronto, which means all forms of transportation which means taxi cabs is a natural (and profitable) extension for people in a hurry. 16. GPS system in bus terminals and major stops so people know when the next bus will arrive. 17. Complete the York University Subway Line. 18. Complete the Yonge Subway Line and complete the loop to the York University Subway Line. 19. Complete the Sheppard Subway Line. 20. Increased rush-hour service in order to prevent crowding during peak times. 21. Increase night/morning service gradually so that subways are open earlier and longer. Below: Maps of where the extension to York University and beyond will go. The Spadina extension to York University was originally conceived as an extension that went nowhere near York University. Instead of heading northwest towards the Steeles/Jane intersection, the line would have headed north and east to Finch and Yonge, if certain politicians had had their way. In the late 1980s, the province of Ontario and Metropolitan Toronto were wrestling over where the city’s next subways should be built. Earlier in the decade, Metro had approved the Network 2011 Plan, which would have placed subways beneath Sheppard Avenue, Eglinton Avenue and through the east and south sides of Toronto’s downtown core. In 1985, the plan was estimated to cost $2.1 billion over thirty years. Had the Conservative government of Bill Davis stayed in power just a few months longer, the plan might have received provincial approval, but the government changed, and the Liberal government of David Peterson wasn’t interested in spending that amount of money on Toronto transit. They set about looking for alternatives. One of the components of the Network 2011 proposal was a Downtown Relief Line, running from Pape Station to the Spadina/Front intersection, allowing commuters from Scarborough quick access to Toronto’s downtown while bypassing the overcongested Bloor-Yonge interchange. In 1985, the proposed line was estimated to cost over a half billion dollars. Support for the line was lukewarm, at best, because of the cost, and because it offered subway service to those who arguably already had it. New subways in the vote-rich suburbs provided more political gain. The terminals at Finch and Wilson would have been another obstacle to this proposal, unless the turnaround times could be decreased, or the terminals eliminated altogether. So, in 1989, planners working for the provincial government proposed extending the Yonge subway, taking it through a sharp turn to the west and then running it along the Ontario Hydro (now Hydro One) right-of-way north of Finch Avenue, past a Bathurst station to a stop at the Dufferin/Finch intersection (where a reservoir would have posed challenges to construction). Then the line would tunnel beneath Dufferin Street and, after a stop at Sheppard, join up with the Spadina subway at Wilson, producing a gigantic belt line. Not only would eliminating the two terminals allow the TTC to run trains closer together, this tight loop would allow passengers boarding at Finch, Sheppard and York Mills stations to “go over the top” and access the downtown stops via the Spadina line, which had capacity to spare, with travel times that were comparable to taking the subway straight down Yonge. A belt line would also have broken the Yonge-University-Spadina into two independent services, one in each direction around the circle, and thus less susceptible to service delays. Between this and proposed bus lane improvements, provincial planners boasted that the Yonge-University-Spadina Belt Line not only eliminated the need for a Downtown Relief Line, but could also reduce the need for a Sheppard subway. In Toronto and looking for some live action and excitement? Check out Toronto's horse races. You could win a $10,000 night at the races! Backers of the Sheppard subway project, including North York Mayor Mel Lastman, were upset when the Belt Line proposal emerged, seemingly from nowhere. Politicians ridiculed the idea of running trains through the deserted Hydro corridors, asking if groundhogs were the intended passengers. Scarborough politicians complained that, unlike the Sheppard proposal, the Belt Line benefitted North York only. Representatives from York University and York Region, however, suggested that the proposal had merit — if the belt line was expanded to run along Steeles Avenue and through the University before heading southeast to the Spadina subway. While this reduced the likelihood that Yonge patrons could “go over the top” to use the Spadina subway to access trips downtown, the line offered improved connections to transit dependent students, as well as a strong alternative to driving for York Region commuters. The belt line still offered the TTC the ability to increase the frequency of service. As the debate between the Network 2011 plan and the Belt Line proposal raged, the Peterson government focused on the one commonality between both plans: a short, one-station extension of the Spadina subway from Wilson station to the Sheppard/Dufferin intersection. To get the construction crews working, Peterson’s Liberals offered to approve the extension. Despite acknowledging that the extension ran “from nowhere to nowhere”, Metro politicians agreed and construction started in 1989. Seven years later, Downsview station opened to the public. The NDP Push the Proposal. In September 1990, the Peterson government fell to Bob Rae and the NDP, and provincial support for new subway construction was delayed, again. Finally, in 1994, the NDP brought forward their “Let’s Move” plan. The Network 2011 proposal had been reduced to the construction of truncated versions of the Sheppard and Eglinton West lines. In addition, the government also proposed to extend the Scarborough RT east and north, and to extend the Spadina line to York University, possibly as the first phase of the belt line. By this time, support for the York University extension had increased. The City of Vaughan was even offering to pay for the cost of constructing Steeles West station. Despite this, Metropolitan Toronto felt that it could not support the Scarborough RT and York University proposals. The city was in the grip of a recession, and the funds weren’t available. In the end, the province and Metro agreed to start construction on the Eglinton West and Sheppard lines and hold back the Scarborough RT and York University extensions for a later date. The defeat of the NDP government and the election of Mike Harris’ Conservatives resulted in the cancellation of the Eglinton West subway, and the York University extension entered a phase of prolonged dormancy. Despite Harris’ elimination of provincial funding for public transportation in 1996, as the Sheppard subway continued construction, the City of Toronto started to think about where next the construction crews would go. On the eve of the 1999 provincial election, Mel Lastman asked TTC planners to consider which projects should have priority. An extension of the Sheppard subway rated highly, as did the York University proposal. The Eglinton West subway and the Scarborough RT extension were hardly mentioned at all. The York University extension had a number of things in its favour. Proposed redevelopments of the Downsview military base, and the prospect of the 2008 Summer Olympics, were strong pushes for the project. Then there was the City of Vaughan which, in the year 2000, brought forward a proposal to build a new city core around the Jane/Highway 7 intersection. To anchor this development, they proposed taking the Spadina subway through York University and north of Steeles to this intersection. They offered to pay for the costs of all construction north of Steeles Avenue, and they promised to lobby their local members of the provincial parliament — who had the ear of the Harris cabinet — to commit provincial funding for the whole extension. York University threw its support behind Vaughan’s proposal, not only to get construction going, but because they didn’t want the subway to end at York University, possibly leading to an onslaught of York Region commuters seeking to park on University land. Vaughan’s support brought the York University extension out of dormancy and made it a priority in the eyes of Toronto planners. The election of the McGuinty Liberal government, and particularly the election of McGuinty’s finance minister Greg Sorbara to the area riding, raised considerable hopes that provincial funding would materialize. With provincial support, the City of Toronto and the TTC embarked on a full environmental assessment and public consultation process, which finally completed late in 2005. The environmental assessment and public consultation process finalized the proposed alignment of the York University extension. 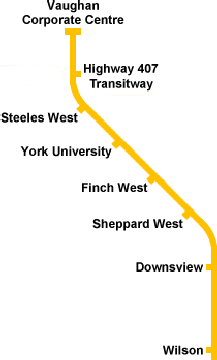 Initially, there was some debate over whether the line should cross CN’s Newmarket subdivision (which the Bradford line GO Trains use)closer to Finch or Sheppard Avenues, and whether the line at Steeles should face northeast for a possible extension towards Yonge Street, or northwest for a possible extension towards Jane and Highway 7. Work would begin at Downsview station. A new pocket track would be built where the line emerges from tunnel south of Downsview station. Initially this pocket track was to be built north of Downsview station, but such a construction would have required a number of businesses to be expropriated and demolished. The pocket track would allow the TTC to short turn trains — originally at Downsview, but with the change, now at Wilson — raising the possibility that the rush hour practise of short turning certain trains at St. Clair West station could be resurrected at Wilson. North of Downsview, the line would curve gently west, passing beneath Sheppard Avenue at Chesswood Drive and proceeding west a short distance south of Sheppard Avenue. A station stop, tentatively named Sheppard West, would be built immediately west of the GO Bradford line. There would be pedestrian entrances leading to Sheppard Avenue and possibly towards Downsview Park, and an on-street transfer with Sheppard Avenue buses. A connection with the Bradford GO line could also be provided. The TTC briefly considered naming this station Park or Parc Downsview Park, but decided to retain the name Sheppard West to avoid confusion with Downsview station next door. Continuing west, the line would pass beneath Sheppard Avenue at Ceramic Road, and then curve gently north, passing beneath Keele Street at St. Regis Crescent, and continuing north under Keele Street. Finch West station would be built beneath the Keele/Finch intersection, featuring a bus terminal connecting with Keele and Finch West buses, commuter parking in the Hydro right-of-way and a passenger pick-up/drop-off area. Currently, this station is tentatively named Finch West. In a report, the TTC dismissed a suggestion of naming the station Keele North, but the commission hasn’t considered other suggestions, including Keele/Finch. This station’s name, along with all the others on the extension, shouldn’t be considered permanent until they are engraved on the station walls. North of Finch West station, the line continues north beneath Keele Street before turning gradually northwest. The next station, tentatively named York University, would be located beneath York University Commons, where a number of transit vehicles currently meet. The station would connect to nearby buildings, but would have no off-street bus terminal. Connections with the TTC, GO, York Region and VIVA would occur on-street. Continuing northwest, the line would enter the Steeles West complex, with a station beneath Steeles Avenue a few hundred metres east of Murray Ross Parkway. There would be pedestrian entrances, and separate TTC, York Region/VIVA and GO Transit bus terminals, with a passenger pick-up/drop-off alongside a large commuter parking lot in the Hydro right-of-way running north of Steeles Avenue. The line would continue some distance northwest into York Region, to allow for the placement of pocket tracks. An extension east along Steeles Avenue has been precluded. Further extensions will be to the northwest into Vaughan. If the Belt Line proposal is resurrected, trains will have to run along Highway 7, which seems unlikely. Despite this, the TTC believes that the extension will help reduce congestion on the Yonge subway, by diverting as many as 2000 rush-hour commuters by intercepting passengers on Finch and Steeles before they travel all the way to the Yonge line. The extension would be 6.2 kilometres long. If approved tomorrow, it would take between five to seven years to design and build. On March 23, 2006, the province of Ontario surprised observers by committing $670 million, not for a subway extension to Steeles West, but for one further into Vaughan, stopping at the proposed Vaughan Corporate Centre at the intersection of Jane and Highway 7. As the funding covers only a fraction of the cost of the extension (Toronto, the Region of York and the federal government will have to raise the rest), the province agreed to put the money in a trust fund, which put the spending on the books for 2006, and thus kept the province in deficit (it has been argued that the Liberal government spent on this project and other initiatives in order to get rid of an unexpected windfall of corporate tax revenues, buying them time so they can end the provincial deficit “in dramatic fashion” on the eve of the 2007 election. Toronto’s mayor, David Miller, supports the project, but notes that the TTC is still struggling to maintain its current system in a state of good repair, and that other projects need attention, including the matter of what to replace the Scarborough RT with, now that it was nearing the end of its design life (the province addressed this with a $1 million commitment to fund an environmental assessment on the possibility of replacing the line with an extension of the Bloor-Danforth subway). Some have wondered whether the TTC should pursue an extension to York University at the same time as it considers what to do to fix or replace the Scarborough RT. The bus-only roadway will significantly improve transit service to York University, not only for the TTC, but for York Region’s new VIVA service. However, the extension retains some powerful supporters, and it could be the first bit of subway construction to begin since the opening of the Sheppard subway. Not bad for a subway proposal that’s comparatively young. Haskill, Scott, ‘Toronto Subway Expansion’, Rail and Transit, March 1993, p3-5, The Upper Canada Railway Society, Toronto (Ontario). Immen, Wallace, ‘Ambitious plan in works to give Vaughan a “heart”’, Globe and Mail, April 10, 2000, pA?, Toronto (Ontario). A preferred route has been chosen for the Spadina subway extension from Downsview station to York University. On Thursday, the Toronto Transit Commission (TTC) showcased the route along with conceptual drawings for stations during an afternoon open house in the East Bear Pit of Central Square on York's Keele campus. Attendance was brisk as members of the York community flocked to the open house to see the result of a series of detailed public consultations. The preferred alignment, said TTC chief engineer Tom Middlebrook, makes the best use of the Keele corridor and offers a win-win for neighbourhoods and the TTC – it produces little interference for residential areas and green space; threads its way through commercial areas; and is a fairly straight route with a minimum of curves, which are costly to build and maintain. The extension will provide improved connections between the TTC subway and GO Transit, York Region Transit, VIVA and TTC Buses. It will provide much-needed subway service to the Keele St.-Finch Ave. area of Toronto, York University and a new inter-regional transit terminal on Steeles Avenue. The subway extension will be about six kilometres and feature four new stations: Sheppard West connecting with the GO Bradford Line; Finch West at Keele St.; the York University Common; and Steeles Ave.West. The extension, which is environmentally sustainable, will reduce traffic congestion and pollution in the area. There is still no money to construct the subway, said Middlebrook, who estimates the extension would cost $1.5 billion to build. In June, the federal government signed a deal giving Toronto $407.2 million in federal gas-tax cash. TTC and city of Toronto officials said there was still not enough money to build the extension. However, that may change, hinted Middlebrook. "There are many advocates for the project, but there certainly seems to be a groundswell of support for funding of the project. There is a lot of dialogue, there have been meetings about preparing a framework for financing the project, the province has set up a group through the Ministry of Public Infrastructure Renewal and there are more meetings scheduled to discuss how to finance the project," said Middlebrook. But no subway can be built without a completed environmental assessment. The next step will be to analyze the comments and data collected from the open house at York University and the public consultations held around the preferred route and develop a final environmental assessment (EA) report which will then be delivered to the provincial Ministry of the Environment for review. "We've done a lot of the refinement and gone through all the material collected from the EA study and come up with a recommended alignment for a four-station extension from Dufferin to Steeles," said Middlebrook. "With the information collected from this phase, we are going to analyze the public comments on the preferred alignment and refine our recommendations," he said. "We will be filing the EA report which contains a summary of all our recommendations, addresses the effects on the environment and details the mitigating measures, including construction techniques and the environmental aspects of construction. That report will summarize all the information and will be submitted to the ministry near the end of the year. "To submit that report, we have to first get approval from the TTC board, so we will go to the Nov. 24 TTC meeting. Then there is a meeting shortly after the TTC meeting of the planning, transportation and works committee of the city. Then we will take the report to the city council meeting," explained Middlebrook. "Staff of York Region and Vaughan will also take separate reports to their respective councils. After all of that, we will then package everything for the Ministry of Environment." The ministry will then, over the course of a 30-week period, analyze the report and provide comments and recommendations. "Then they give it a thumbs up or thumbs down," said Middlebrook. "I absolutely think it will be a thumbs up. The EA process is a planning process and is a process that says, given the same information, will others come up with the same recommendations. The TTC has been going through this extensive consultation which is a litmus test and I think we will pass the test." "We are very pleased with the preferred route and we think the station designs will continue to evolve," said Ted Spence, senior policy advisor and executive director of York University's Office of Institutional Research & Analysis. "The TTC got some very good feedback this morning at their stakeholder workshop at York University. The workshop included University stakeholders and representatives from other groups and there were about 50 people in attendance who provided some very positive feedback." During the first phase of the EA, route one was selected as the preferred route. (See the April 26, 2004 issue of YFile.) In phase two of the EA, the project team presented a series of alignments for the south and north sections within route one. Alternative bus terminal concepts were developed for the stations. (See the May 19, 2005 issue of YFile.) Phase three showcased the preferred alignment which has the fewest number of curves resulting in reduced operating and maintenance costs for the TTC. It also avoids a number of sensitive buildings on York’s Keele campus and preserves certain parcels on campus for short-term development. From the Sheppard West Station and the Downsview Park lands, the subway will be constructed under Keele St. making use of the Keele St. right of way and minimizing impacts on private property. In the preferred alignment, the York University subway station is located in the York Common. The Common is a current transit hub serving over 70,000 faculty, staff and students. From the York University subway station, the subway will extend to the inter-regional transit terminal on Steeles Ave. The Steeles Ave. West station will provide access to the Northwest part of York’s Keele campus and Black Creek Pioneer Village. The extension to the Jane and Highway 7 area is currently being planned and protected for by York Region and the city of Vaughan. The city of Toronto estimates that for every one dollar spent on the subway, two dollars are invested in the community by the private sector. For more information or to provide a comment online about the preferred alignment, visit the TTC Web site; click on the link to the Spadina extension to view the full presentation and descriptions of the EA process.